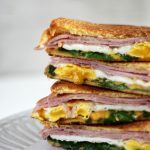 This buttery Grilled Ham and Cheese is the perfect weekend brunch or easy one-pan breakfast! 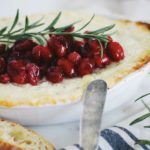 This post is brought to you in collaboration with Maille. It’s easy. Comforting. Brings you back to childhood. Somehow, a warm, gooey grilled cheese makes things feel just a little bit better. Grilled cheese and soup night is certainly a thing in our house. 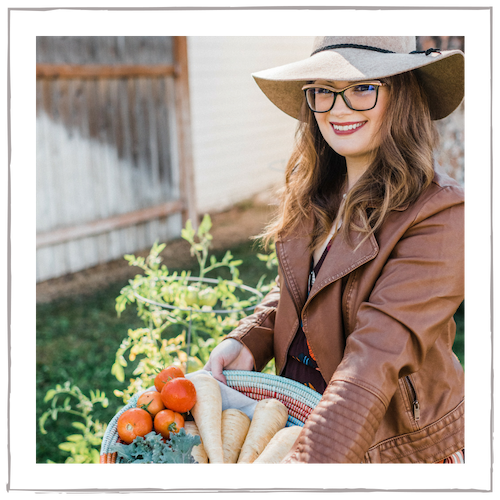 There are just some days where you are too exhausted to cook or the weight of life is just a bit too heavy. You know those days. When I do not want to cook, and when I need some comfort food, a grilled cheese is a go-to. It’s a once in a while treat, it’s nostalgic, and it’s delicious. Not to mention, a grilled cheese is so versatile. 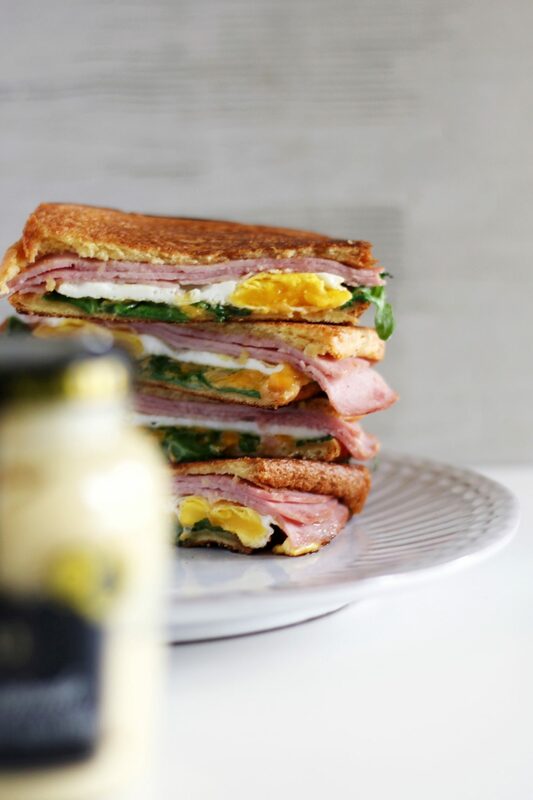 Like this buttery, brunch-worthy grilled ham and cheese with a perfectly fried egg, peppery arugula, and tangy, bold Dijon mustard. One morning, I created this grilled ham and cheese using ingredients I had on hand. I was inspired by a combination of the classic Croque Madame meets grilled cheese sandwich. My secret to an amazing grilled cheese sandwich? Dijon mustard. I first learned of making grilled cheese with mustard when I saw Alton Brown do it on TV, and have been obsessed since. Dijon mustard gives a grilled cheese sandwich a whole new depth of bold, spicy flavor. My favorite Dijon mustard is Maille Dijon Originale Mustard. 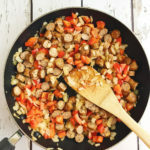 I’m always experimenting with their mustard to create balanced, sweet-meets-savory recipes, such as this grilled cheese and ham or a Chicken Apple Sausage Skillet. 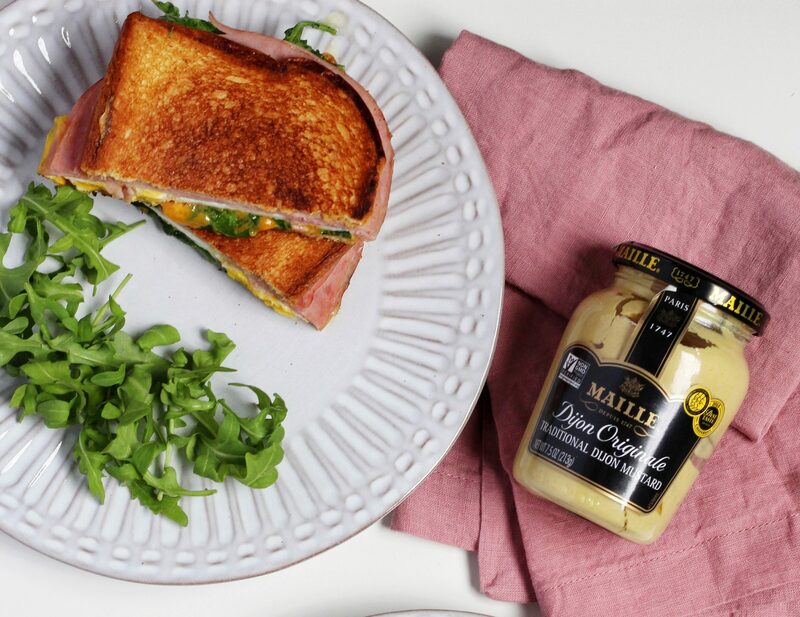 Maille’s mustards are creamy, balanced, and high-quality. 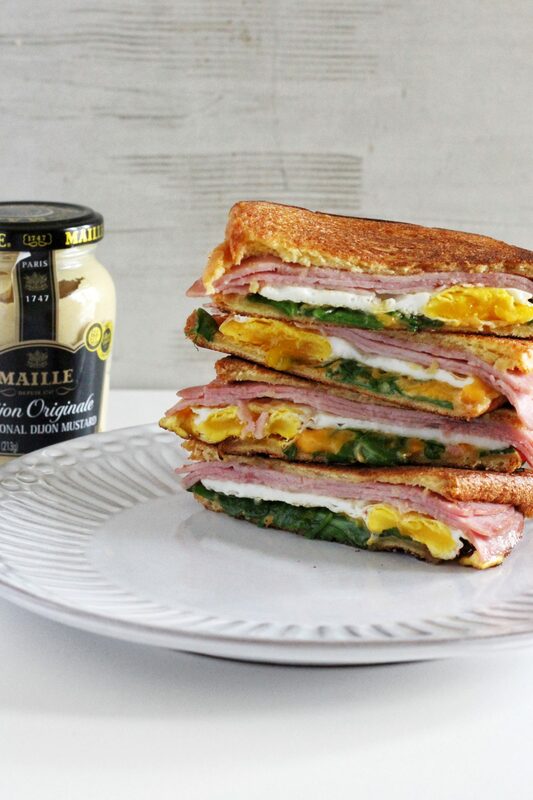 While I used Maille Dijon Originale Mustard here, the Maille Honey Dijon Mustard would also be delicious for a slighter sweeter sandwich. What’s your favorite way to dress up a grilled cheese? 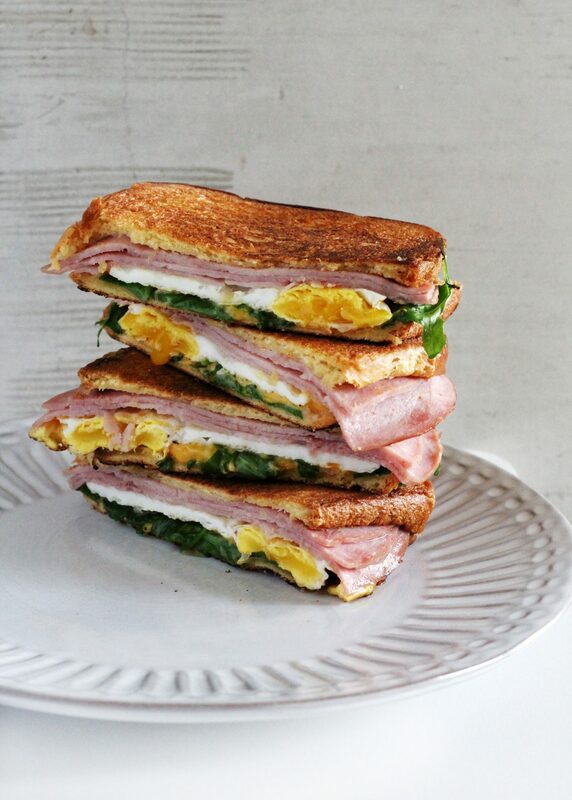 We hope that you make and enjoy this brunch-ready Grilled Ham and Cheese! 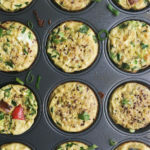 Enter Maille’s giveaway to win a $500 brunch makeover here! This buttery Grilled Ham and Cheese is the perfect weekend brunch or easy one-pan breakfast! Melt one tablespoon of butter in a preheated skillet and fry the eggs to your liking. Season with salt and pepper. Transfer the fried eggs to a plate. Assemble the sandwiches. Spread 1 teaspoon of Dijon mustard on each slice of bread. 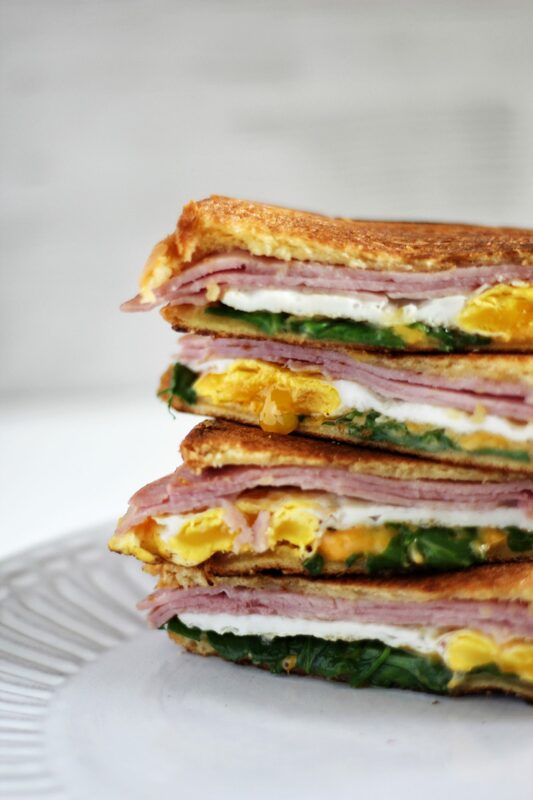 Layer two slices of bread each with 3 slices of ham, 1 fried egg, and 2 slices of cheese. 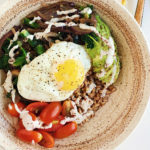 Top with 1/4 cup of arugula. 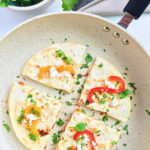 Melt the last tablespoon of butter in the skillet and cook the sandwiches until golden brown on each side and the cheese has melted, about 2-3 minutes per side. Enjoy! My friend grew up on grilled cheese sandwiches and still enjoys them. I like how this one is more of an adult version. Oh my that looks delicious! Some homemade soup to go along with it too! 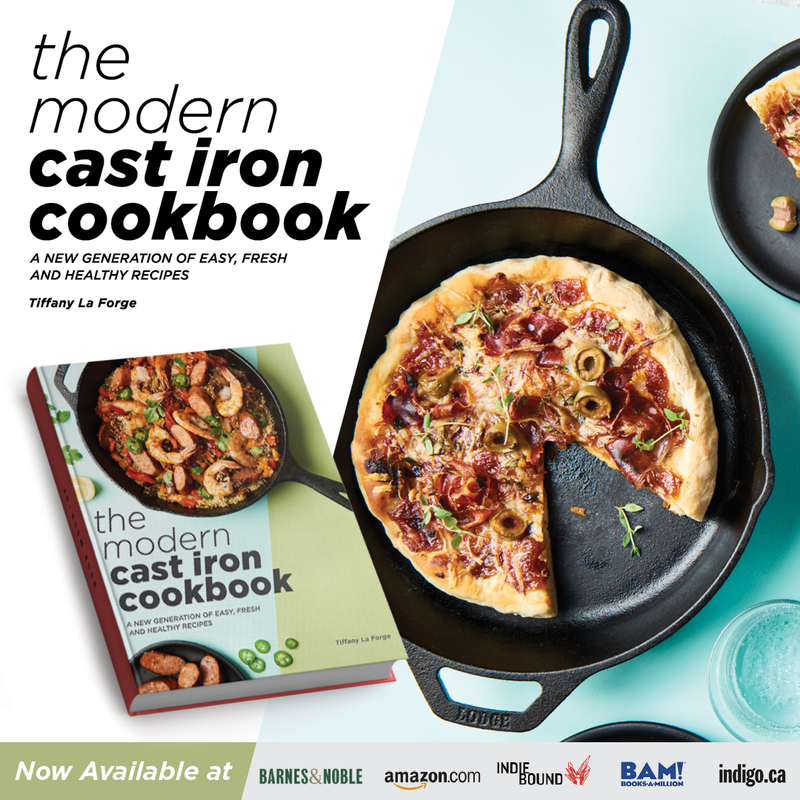 Oh my goodness….. this looks delicious! 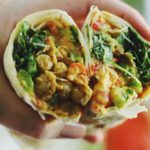 I am super hungry and this is screaming my name… thank you for the delicious recipe!